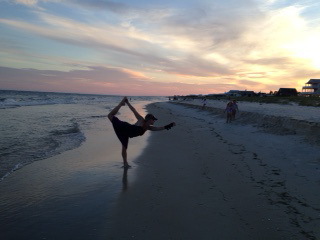 Spirit of the River Yoga Studio, Has moved to Riverfront Therapy's home office 143 4th street, Apalachicola, Florida. $30-100 for private or groups classes WE TAKE SQUARE!! Credit Cards accepted. Classes are made by appointment, check in via text 850 653-6719. Foundational Beginner is the basics or foundation of each and every pose. Included is the principles behind why and what benefits are in each posture. I am encouraging you throughout class to tune into your own body as to avoid injury. Absolute Beginner Yoga is a slower paced class learning basic sequences and basic stretches, breathing exercises and a short meditation. Props will be explained and used to benefit any limitations you may experience. Intermediate Yoga is a faster paced class with full sun salutes, core series, downward dog holds with up dog variations, three-legged dog and prep poses for headstand, handstand, shoulder stand, forearm stand...includes meditation and pranayama in every class. Gentle/Chair Yoga is for people with injuries, limitations from surgeries, seniors, anyone who thinks they can't do yoga. We work on modifications for each foundational pose and do everything a beginner class does just with a more gentle intention to work within our own limitations to move beyond the stiff joints and into a more supple body and mind. There are some Self massage techniques included in this class. Vinyasa: Mulitple levels class which has a nice pace flowing breath with movements. "Vinyasa" in sun salutes is the portion of flowing from Down Dog into Cobra/Up Dog on one breath; this creates a steady pace, builds upper body strength and stretche all areas of the spine. 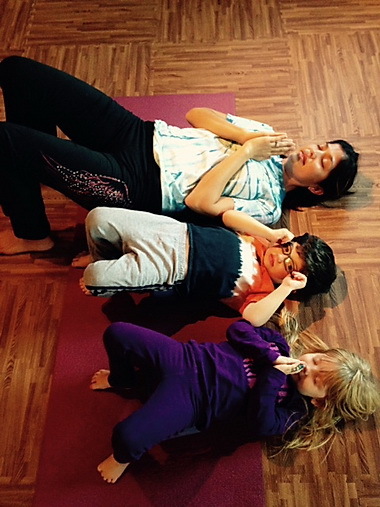 Kids Yoga Is for 30 min. we try to encourage all ages but understand that not all ages are capable of being on their own. We encourage parents at no extra charge to participate especially with the younger ones! Group Classes held on location or groups of three at our studio, other locations are listed as well. Hatha Yoga is the general style of teaching; a depth and knowledge passed on from the ages of balancing the body through asana, pranayam, dyana, dharana and samadhi is it's source, Kathy is nationally certified E-RYT200 , RYT500 with Yoga Alliance. Her experience in anatomy and kineseology makes for a great class. Denise and Sondra have a personal practice of over 30 years and are sharing the depth of this experience in their classes. 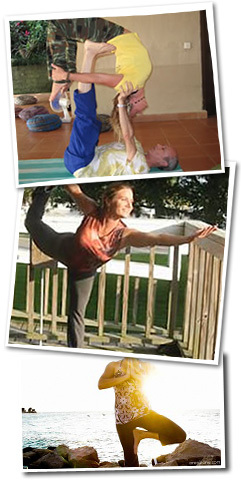 Caci Wallace and Alec Macbeth are our newest teachers but not new to yoga. © 2014 Spirit of the River Yoga. All rights reserved.